Digital Advertising is a game of cat and mouse. Advertisers search for new ways to reach the audience, and they try to find ways to avoid the ads. When a campaign created, it might run successfully for a specific period, if the content is exciting and engaging. Slowly things may change as the target audience got saturated because the ad is viewed by them many times.YouTube Ad Fatigue is big problem to get best results and ROI. They may even feel irritated and stop clicking the ad on your Videos. Ad fatigue can define as the condition that arises when the audiences are tired of viewing the same ad. If the consumers feel that they see too many ads for a brand every day, it can lead to adverse sentiments. It affects the ad performance and affects the ROI of the Video Campaign. Businesses are using social media platforms as a marketing tool. YouTube is one of the best places to reach the target audience and deliver the message powerfully. But if the same Video Ad is shown to the consumers, again and again, they may feel annoyed, lose interest and scroll past it. There are many reasons for YouTube Ad Fatigue. It might be because the ad is shown to the target audience a lot. The ad might be appearing in the feed of the audience, and finally, they got so used to it that they stop clicking on it. Studies reveal that based on the budgets of the ads and the number of targeted audience, YouTube Ads Fatigue may start as early as three days after the campaign is launched leading to drop in click-through rates and affecting the sales. There are some ways that brands should try to adjust their approach and minimise the YouTube Ad Fatigue and reach the goals with their Video Ad Campaigns. Advertisers might have to refresh their Video Ad creatives every two weeks to combat ad fatigue. Advertisers may feel this is a waste of time and money. 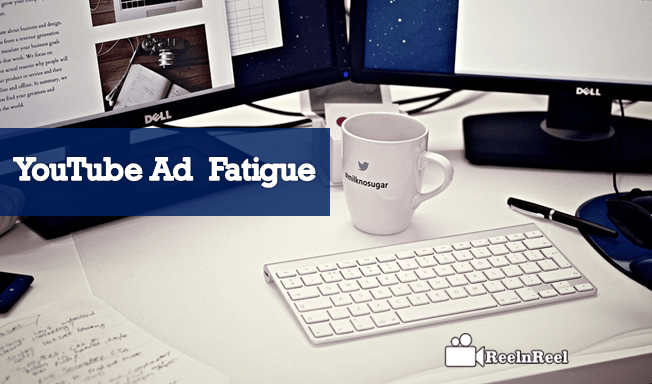 Here are some strategies that help to fight YouTube Ad Fatigue. Consumers love to watch ads that are relevant to them. Identify the target audience and create segments among them. When you deliver your ad to this audience, it will perform more efficiently and engages more. Digital Advertising allows targeting audience based on personalized metrics such as interests, behaviors, location, and action. Right strategy helps to reach the right consumer at the right time and right place. Keep the ad frequency very low. Unless you are targeting millions of consumers, the social websites re-show your ad to the audience. The audience thus will see the ad more times and the more and more opportunities they showed the announcement, the more they get annoyed. High ad frequency can affect the click-through rate. Cost per click or the Video Ad Campaigns. Track the metrics and if the ad frequency is more than three create new ones. Another essential thing to avoid ad fatigue is to build a content calendar. Video content calendar should done after defining the target audience, size of the audience and the ad rotation. Create new YouTube ads before the average frequency of the ad is around 3. The audience gets tired of watching the same ad from the Brand every day. But if they see different ads from the Brand, they will not feel bored. Create multiple YouTube Video Ads for the same product. Track the ad frequency and if the need arises immediately show the other ad to the audience. Rotating the ads for every three to four days and avoids ad fatigue. Do not deliver the same ad to all the people. Instead, use the full potential of different audience groups. Split the audience into various divisions. Show an ad group to specific audience group for a couple of days and then change the ad group. Target groups avoid people getting bored of the seeing the ads. Audience rotation is helpful for the brands that have a large group of prospective customers. The interests and character of the audience may be different in different categories. Advertisers must monitor and analyze the ad frequency to check how the ad campaigns are working. There are third-party tools to measure the ad frequency levels as the campaign is happening. Evaluate the cost per view metric. Check whether it is increasing or decreasing. Include a call to action overlay in the Video Ad. Showing the same ad again and again to the audience may cause them to see and think about it differently. It is not that a person should be shown the ad multiple times before he responds. Avoid annoying him with the ads and instead, make the customer experience more positive. That will result in reducing ad blocking and ad fatigue. Understand the customer point of view, stay customer focused so that the brand message is improved. Ad fatigue is a threat to digital advertising. Advertisers must get serious about ad frequency as this should be a primary consideration for the success of any YouTube Ad Campaign. People are real, tired of the ads on digital platforms’, but they love to share and follow the YouTube content that is related to them. Brands should focus on creating valued content to the people. Advertisers must be aware of Ad Fatigue to advertise on YouTube Platform. We should follow some strategies to implement it. We have listed some YouTube Ad Fatigue optimization Strategies to support by every advertiser and perform best Video Ad Campaigns.